Birds living around the site of the Chernobyl nuclear accident have 5% smaller brains, an effect directly linked to lingering background radiation. The finding comes from a study of 550 birds belonging to 48 different species living in the region, published in the journal PLoS One. 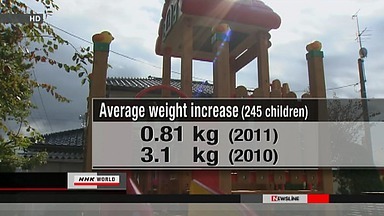 A survey shows that some children in Fukushima Prefecture have smaller average weight gains this year compared to the year before. A pediatrician says the results indicate the negative effects of the nuclear plant accident in March. Doctor Shintaro Kikuchi tracked the weights of 245 children aged from 4 to 6 in 2 kindergartens in Koriyama City, Fukushima Prefecture. The results show an average weight increase of 0.81 kilograms over the past year through June. The increase for children in the same age group the previous year was 3.1 kilograms. The average increase for children aged 5 to 6 in the survey was 0.84 kilograms. But a nationwide health ministry survey conducted last year for children of the same age group showed an average gain of 1.8 kilograms. The Fukushima Daiichi nuclear accident has caused high levels of radioactivity in areas around the plant. Koriyama is located about 60 kilometers from the facility and many children in the city have been forced to play indoors to avoid contamination. Kikuchi noted that the smaller weight increases could be related to reduced appetite resulting from less exercise as well as changes in the secretion of growth hormones due to stress. He said measures should be taken to restore normal hormone levels in the children.